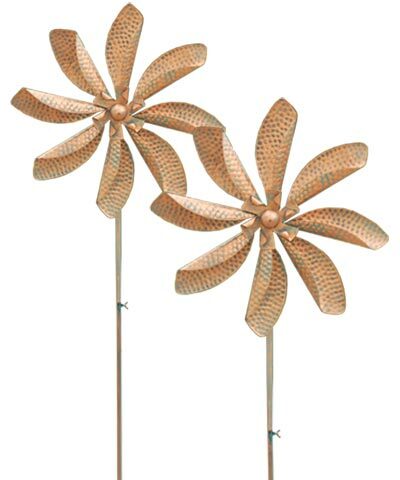 Add two hardy blooms to your garden using these Gardman Zinnia Kinetic Wind Spinners. These two, matching spinners bring vivid, moving artwork to your landscaping, thanks to their internal bearings and copper color. A 20" diameter flower shape tops each of the 53" tall shafts, and eight petals on each curve at the front to better capture the wind. Smaller petal shapes sit in front of the larger ones, evoking a zinnia flower, and a hammered pattern on each petal adds bold texture. Verdigris tones beneath the copper colored finish offer dimension and contrast, and visually mix when the petals spin in the wind. A 5.5" long, step-in base helps keep each unit stable in your garden soil, and the pointed ends insert in the yard easily. The all metal construction lasts for many seasons, and the classic colors enhance your garden perfectly. Showcase two bright blooms in your yard with these Zinnia Kinetic Wind Spinners. Some assembly required. Note: This case pack includes 2 of the Gardman Zinnia Kinetic Wind Spinners, Copper, 63"H.